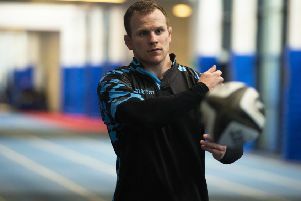 Sam Johnson is in no doubt as to the magnitude of the task facing Glasgow Warriors at Saracens in their Heineken Champions Cup quarter-final tie on Saturday. Saracens have beaten the Warriors twice already this season in pool games and prevailed when the sides met at the same stage of the tournament in 2017. Scotland centre Johnson said: “It’s probably the hardest (game) in Europe. They are a great team, they have been for years. “They are going to come out all guns blazing with that power game. We’re going to go down there and do our best to win. “I thought we were actually pretty good against them last time. Against the top teams you can be good for 85 per cent or 90 per cent of the game, it’s just that 10 per cent difference where they continue to do what they do well and that’s when they punish you. “We need to front up physically, be accurate for the whole 80 minutes and just do our best. “It (victory) would be huge. We went down there a couple of years ago and they put us to the sword so we’re aware that they’re a great, great side.